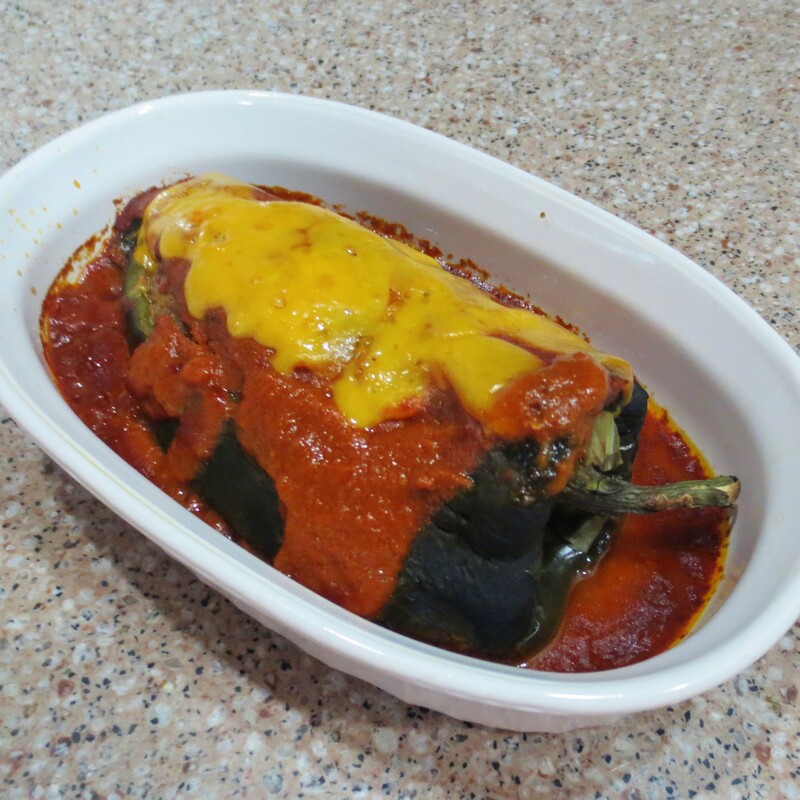 This version of Emily’s Chile Rellenos is baked, not fried, which save 1/3 of the calories over the original recipe. 1. Roast the poblano peppers on a grill or under the broiler, turning frequently, until nicely charred on all sides. Place the hot peppers in a plastic bag and seal. When cool enough to handle peel the skin off the peppers and cut a slit to remove the seeds, leaving the stem and tip whole. 2. Preheat the oven to 400° and mist a baking dish with non-stick spray. 3. In a 10 inch skillet, break up the ground chuck and cook, stirring occasionally, until browned and crumbly. Season the meat with the chili powder, cumin, 1 tsp garlic powder, 1/2 tsp salt, and 1/4 tsp black pepper. Remove from the pan and set aside. 4. In the same skillet, heat the olive oil and saute the onion, serrano pepper, and minced garlic with a dash of salt until the onions turn clear. Return the ground beef to the pan, along with the cheese, and stir until the cheese has melted into the meat mixture. Stuff the poblanos with the meat mixture. 5. Spoon a small amount of enchilada sauce into the bottom of the baking dish. Arrange the stuffed peppers on top of the sauce, then pour the remaining sauce over the peppers and sprinkle with the shredded cheddar cheese. Cover with foil. 6. Bake 20 to 30 minutes, until hot.